This rawnola is perfect for a quick breakfast when you are running behind and need to get out the door! I’m always so curious about those people who don’t eat breakfast. Like, aren’t you hungry when you wake up?? Didn’t you dream about food? Didn’t you wake up thinking about food? Is it just me that dreams about food? Probably. My entire life revolves around food. Personally, I have to eat within a half hour of waking up or I get reeeeal hangry. 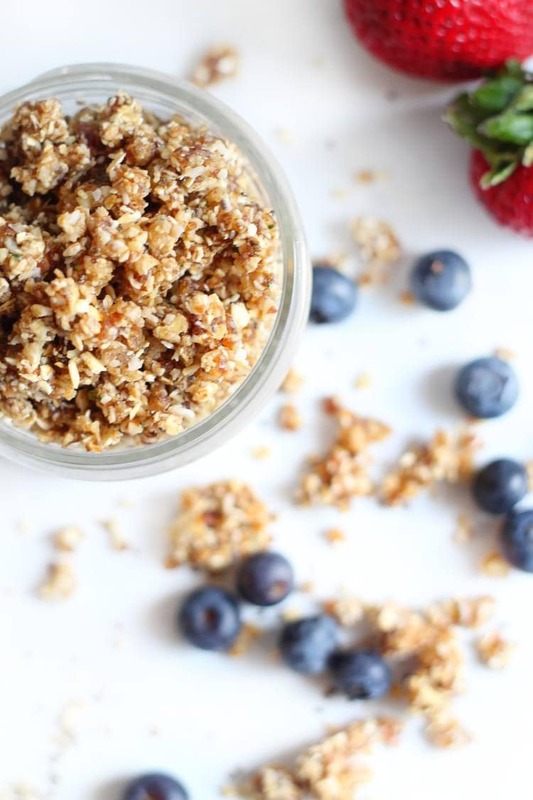 I don’t need a big lavish spread every morning–usually I just have maple yogurt with strawberries, blueberries and this super delish rawnola. Maybe some of you don’t eat breakfast because you don’t have time? Trust me you have time for this! If you use your food processor, this rawnola might actually take less than 5 minutes. Like 3 and a half minutes. AND it makes a big mason jar full so you’ve got enough for at least a week’s worth of breakfasts depending on how many people you’re feeding. It will stay fresh in your fridge for a couple weeks too, but your kids are sure to gobble this up so chances are good it won’t last that long. This recipe is a great way to use up any nuts, seeds or other add ins that you might have taking up valuable real estate in your cupboards. Chocolate chips would be a welcomed addition or maybe even some dried fruit! 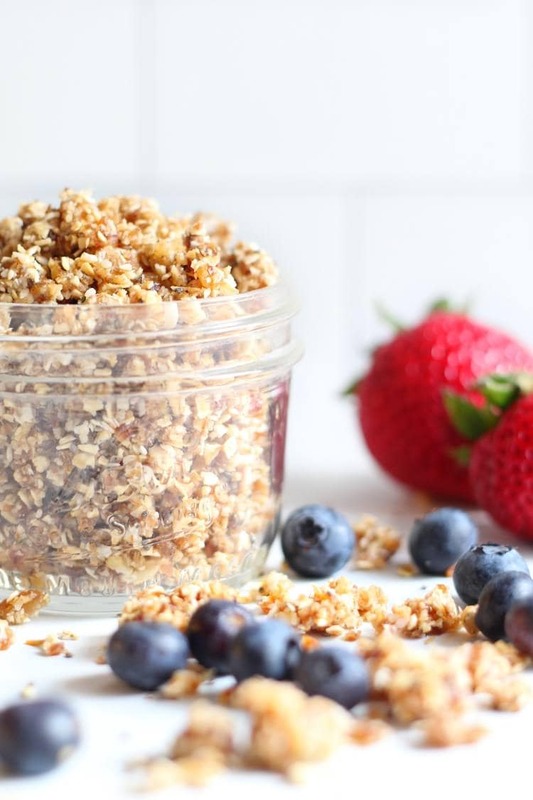 And if you love this recipe, make sure to check out my Vegan Maple Pecan Granola too! Not just for vegans!! 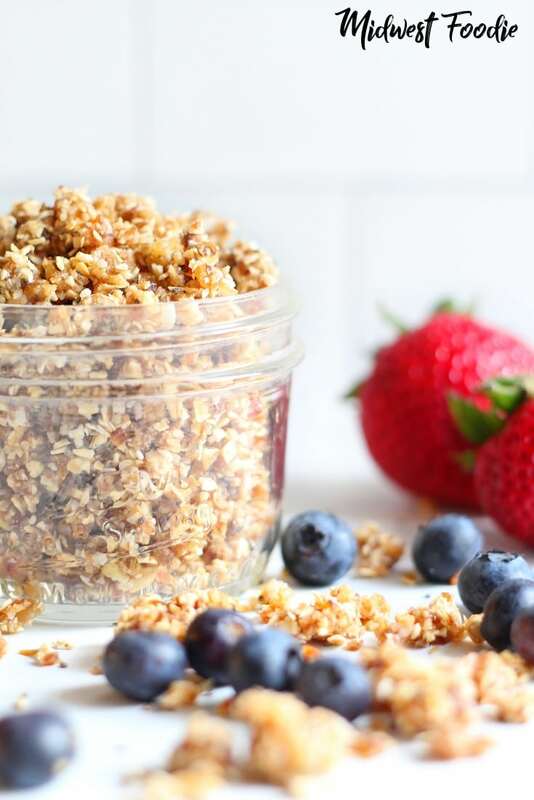 This raw take on classic granola is the perfect healthy breakfast to fuel you through a busy morning! Add dates to a food processor and process until they are chopped. Add remaining ingredients and pulse until everything is well chopped and mixed. The texture should be clumpy yet soft. 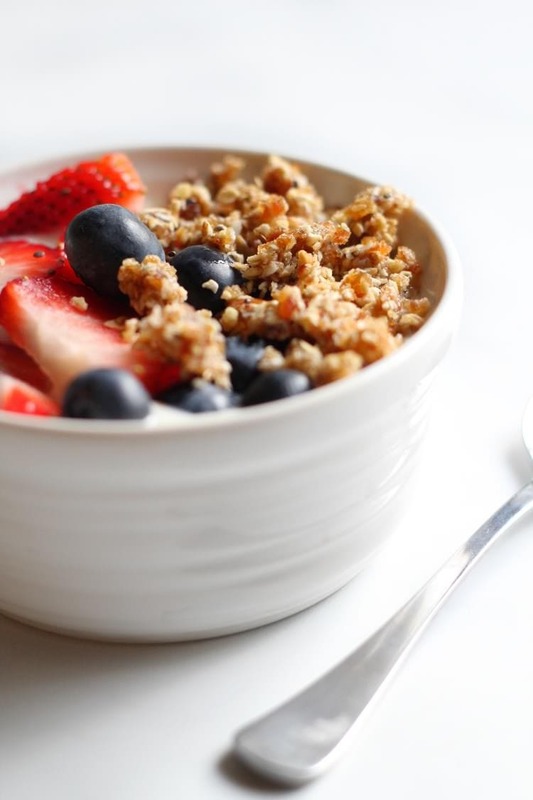 Serve with your favorite yogurt or sliced fruit and enjoy!